Mission: Impossible - Fallout, Tom Cruise's sixth film in the Hollywood spy action franchise, raked in an estimated 550 million yuan ($80 million) over the weekend at the Chinese mainland box office, the series' best opening in China. The mainland is the last stop on the film's world tour, so its performance in the world's second largest film market is crucial for its global box office take, which currently sits at around $620 million including China. 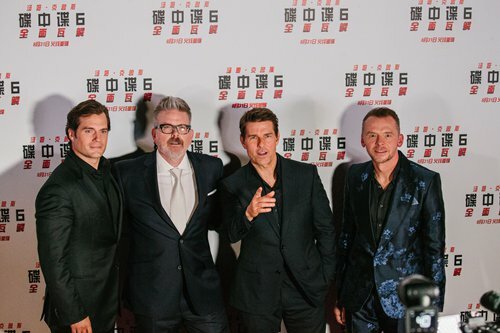 To promote the film, director Christopher McQuarrie - also director of the franchise's fifth film - and lead stars Tom Cruise, Henry Cavill and Simon Pegg attended the premiere at the Imperial Ancestral Temple near the Forbidden City in Beijing on Wednesday. The Imperial Ancestral Temple, or Taimiao, was a royal temple where emperors held ceremonies to pay their respects to their ancestors during the Ming (1368-1644) and Qing (1644-1911) dynasties. A national key cultural site, it is now used to hold commercial events from time to time. One of the most well-known Hollywood stars in China, Cruise is known in Chinese as Atang Ge (Brother Tommy). During the event, the star caused screams everywhere he went, took selfies with fans and even walked back to interact with fans who stood in more remote areas. This was Cruise's second visit to the Chinese capital after his 2015 trip to promote the fifth movie in the spy series. Short videos and photos of the stars quickly went viral on Chinese social media platforms, triggering a wave of praise for the 50-something's well-maintained shape and charisma. Despite the fact that it has been 22 years since the first film in the franchise made its debut, Cruise is still regarded the soul of the series. "There is a certain emotional quality in the movie that goes all the way back to the first film. The sense of team and the sense of achieving the impossible resonate with people. I think there is a certain kind of wish fulfillment in this franchise that you don't get anywhere else," McQuarrie told the Global Times in an interview on Thursday. "And most importantly, Tom and the way he approaches making this movie is a way that goes back to the Silent Era; we talk about Buster Keaton, Charlie Chaplin, Harold Lloyd - all filmmakers in their own right who performed their own stunts and did their own action scenes." Holding an 8.1/10 rating on IMDb and a 97 percent fresh rating on Rotten Tomatoes, the sequel is regarded by some overseas critics as "the best of the series ever." The film currently holds an 8.3/10 rating on Chinese review platform Douban based on more than 68,000 reviews. This makes it the highest-rated film in the franchise, followed by Ghost Protocol, the series' fourth film, at 8.2/10. "Simply speaking, while the other spy series are becoming more and more simple and rustic, the Mission: Impossible franchise is putting on more courageous fight scenes and becoming more mature and serious," wrote Douban user Wei Xuehun in a review that has garnered some 2,800 likes on the platform. While many have given the film a four-and-above-star rating, some Chinese netizens have found the sixth film cliché and less exciting than earlier films in the series. "One of the worst in the series, it parallels the second and the third movie. Many of the action scenes have been seen before, such as the car chase in Paris and bare-handed cliff climbing (which is actually lamer than the Burj Khalifa Tower scene in the fourth film)," wrote another Douban user Da Shoushou.